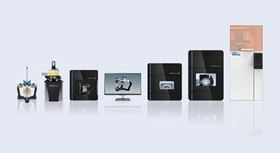 Amann Girrbach's Ceramill digital dental workflow now includes 3D Systems' NextDent 5100 3D dental printer. Amann Girrbach, a supplier of digital dental prosthetics says that it will integrate one of 3D Systems’ additive manufacturing (AM) machines into its Ceramill System digital dental workflow. 3D Systems NextDent 5100 machine can reportedly produce precision trays, models, surgical guides, dentures, orthodontic splints, crowns and bridges at print speeds up to 4x faster and at reduced cost compared to competitive systems. It can print 30 biocompatible and CE-certified NextDent materials for a range of dental applications for lab managers, dental technicians, dental prosthetic technicians and clinical prosthodontists and orthodontists. ‘A dental model is an important part of the restoration process and now with the Next Dent 5100 our customers can print their own models cost-effectively without having to move outside the Ceramill workflow,’ said Christian Ermer, head of product management at Amann Girrbach.